When you think of the tundra, you may think of a cold, lifeless wasteland. The extremely cold temperatures and lack of much vegetation does make it difficult for many life forms to survive here, but other species thrive in these harsh conditions, including hundreds of species of beetles. Although there are hundreds of beetle species, the characteristics of the tundra make it suitable for three specific types of beetles. The tundra is a region mostly found in the northern hemisphere. It is the coldest and driest biome, with an average temperature of around 18 degrees below zero Fahrenheit. In the summer, temperatures can get up to about 60 degrees, although they drop to freezing again at night. The ground is permanently frozen, meaning the land is largely treeless. Usually only plants that grow close to the ground, such as mosses and lichens, can survive on the rocky surfaces of the tundra. Great diving beetles (Dytiscus marginalis) are large, aquatic beetles found across northern Europe and northern Asia, including regions classified as part of the tundra. They prefer to spend most of their time underwater, especially in vegetated freshwater areas. Before diving, they collect air bubbles underneath their wing cases, which go into their spiracles and help them survive underwater. They are predators who can grow up to 1.4 inches in length and will eat many freshwater creatures, including small fish. Ground beetles are the most common type of beetle in the tundra, and there are many different species. One variety, Carabus glabratus, is widespread in both central and northern Europe, including parts of the Arctic. 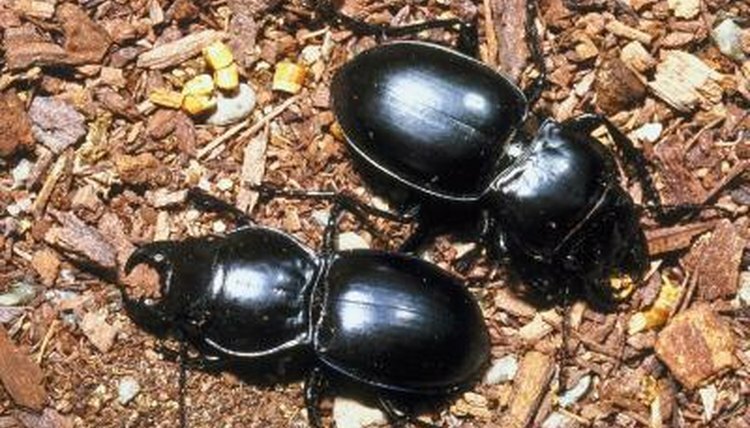 They are most active during the day, unlike many other species of ground beetles, and thrive in damp areas, such as on hill peat and moss -- and so can usually be found around the low-growing plants in the tundra. As their name suggests, red flat bark beetles (Cucujus clavipes puniceus) live on trees and therefore cannot survive in the tundra above the tree line, but they have been found as far north as the tree line goes on the border of the tundra in the Yukon. They spend their winters between the moist areas of dead bark and trees and can survive temperatures as frigid as 94 degrees below zero Fahrenheit. They manage this by producing an antifreeze protein that binds to sites where ice would form in the winter, producing glycerol that drives the freezing point down, and by losing water in their bodies before winter so they don’t freeze.